The Atlantis design philosophy is to treat stormwater at the source. This ensures that rainfall is captured as quick as possible at the source, and that minimum overland flow is generated. To achieve this design concept infiltration catchment areas are designed via high absorption swales and infiltration sub surface channels. That’s the concept behind the Atlantis Ecological Road design. 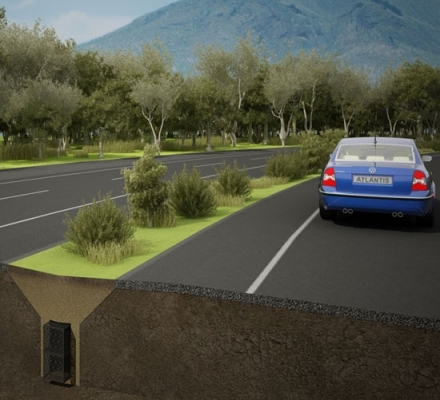 The Atlantis system captures surface runoff from roads and, instead of transporting it to a central storage pond, provides short-term localized storage so that stormwater can be either infiltrated to recharge groundwater, released at a controlled rate, or recycled for irrigation. The Atlantis system also provides a strong, permeable structure, that can capture and manage water along the length of the system. Our team of engineers can assist you in your projects with loading calculations an design recommendations. Atlantis solutions provide benefits for developers, municipality, and the community.